Halo settings became very popular again around 2005. With a tough economy looming, ring designers still needed to have something to show consumers looking for an engagement ring that is beautiful and less expensive, but not looking like it is all they can afford. 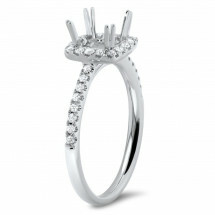 The halo engagement rings was an enormous success. The halo acts like a frame around the diamond but is has diamonds itself, making the appearance stand out, or make the diamond appear larger. 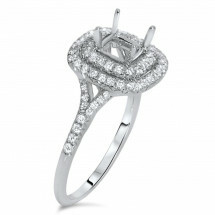 This allowed jewelry stores to combat the dismal economy in a positive way. Now their customers can get the look they were after all along. The look of any engagement ring is always important, but adding the halo sets it off even more than the previous engagement ring designs. 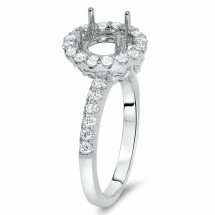 This is not a new phenomenon, because haloes around center stones go back a few centuries. As recent as Kate Middleton, the future Queen Consort of England, with her 18 karat white gold ring set with a 12 carat blue Ceylon Sapphire, haloed in 14 round brilliant diamonds, and as far back as gemstones surrounded in roughly cut diamonds in the Georgian and Victorian Eras, haloes have been around a long time surround the center stone we love. 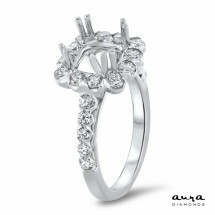 Halo engagement rings started with sapphires, rubies, emeralds and other colored as center stones. When diamond cutting technology got better, larger diamonds (larger than half carat) were used as center stones, but by then the halo style gave way to other designs and was not a regular item for another 200 years. The halo engagement rings comes in so many styles starting with the simple halo and diamonds down the side and is designed with any shape center stone including fancy colored diamonds. 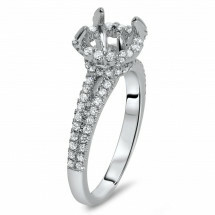 Today, the halo engagement rings is back and some are choosing a fancy colored diamond. The resurgence of fancy colored diamonds owes much of its rebirth to the halo because it created the perfect frame or showcase for a brilliant stone. 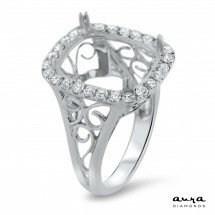 The halo's flexibility has enhanced all the engagement designs of today. 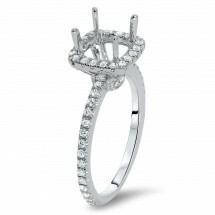 The halo is used in pave, three stone, vintage and oddly enough, the solitaire without any side stones. The halo is often used to make the center larger, but it has become more than that. 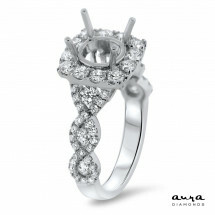 The halo is used to draw attention to the center stone in a unique and stunning way regardless of the style or shape of the center stone.